On a cold Friday afternoon, one that makes you question the idea of MLS playing a winter schedule, two teams played the most important match of their 2013 season. The game was the 2013 CIS Semi-Finals and the teams were York University and University of British Columbia, however, in many ways the game was Toronto FC verse the Vancouver Whitecaps. York and UBC have become a popular next stops in soccer careers for TFC and Whitecaps Academy players after being released, or those still holding on as a senior academy player. York currently has seven players with Toronto FC roots, with six of them playing Friday's game, while UBC also has six players with Vancouver Whitecaps roots, four of which played on Friday. Although they were missing Reynold Stewart, a 5th year player and team leader who won the top player of the year in Canada West. York also took the lead in the 11th minute through current TFC Academy player and York first year student Dylan Sacremento. UBC Sean Einarsson tied the game in the 24th minute, who doesn't have Whitecaps ties, while former Whitecaps U18 player Milad Mehrabi scored the winner for UBC in the 58th minute as the Thunderbirds held on to win the game 2-1 and advance to the CIS Finals. Of all the games at the tournament, this game showed the most class and York actually had more shots on target: 5-3. UBC went on to beat Laval 3-1 in the finals, a game played on a snowy Sunday to repeat as CIS Champions. All three of UBC's goals were scored by players with Whitecaps ties. Niall Cousens, Navid Mashinchi, and Milad Mehrabi scored the game winning goal in the second straight game. Laval are a school featuring mostly local-based players, who are part of the Quebec youth system, took the lead through Amaury Fauvergue, but were outplayed throughout the game including being outshot on target 9 to 1. As mentioned in my last college review article, there is big difference in attitude between the American and Canadian collegiate game. 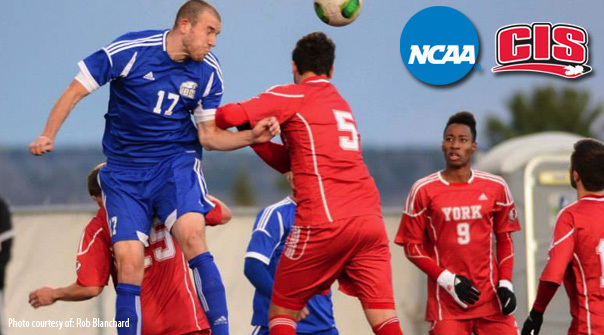 While the CIS season is now complete, and players will not be mentioned again until next September, anyone who follows the North American game will start becoming aware of the current NCAA season as teams are a week away from conference tournaments and a couple of weeks away from the soccer version of March Madness. As well, individual players will be mentioned for Homegrown positions, Generations Adidas and senior contracts, and where the others will fall in the draft. It's funny how the hype machine works in sports media, especially when it comes to under-represented sports like soccer. In the past, as schools who progressed through the NCAA tournament, awareness of potential draft picks becomes apparent to the point where a good tournament could take a player from an unknown to a 1st round selection. Often players whose schools miss the big dance can go from being a prospect to being missed in the draft all together. Even one game can influence what one might call an expert opinion and last year's NCAA final was a good example of this. Indiana won the tournament, lead by a number of players, however the name that stuck out was Femi Hollinger-Janzen: a very raw freshman with good athleticism and a haircut to match his name. Before the tournament Hollinger-Janzen was a sub with just three starts and two goals. Two goals in the tournament, including the game winner in the semi-finals against Creighton, put him on everybodies watch list and calls for possible GA contracts last year and this season. This season Hollinger-Janzen has struggled to keep a starting role, has scored five goals, and his Hoosiers are out of the tournament picture with a record of 6 wins 11 losses and one tie. When it comes to evaluating college talent the question of who should get a GA contract is always one of the most debated issues. GA (Generation Adidas) are contracts given to players to leave school early and are mainly in place to protect MLS interests so the player doesn't leave school on his own and sign with a team in Europe. It is true that talent-wise the GA's tend to have the greatest potential, since each year you are taking on average ten players out of NCAA soccer who would have been the most high profile seniors. However, I have done a lot of statistical work regarding GA's and the reality is, performance-wise, there is not much difference between players given GA contracts and players drafted as seniors, but the GA's are paid almost four times more than the seniors. The GA phenomenon also trickles down to the media as sites such as mlssoccer.com starts concentrating on the MLS Draft. It gets so bad, to the point where I've read some writers' draft predictions, and 20 of 40 players picked would have to be GA's, despite the league only giving 10 places or less. In my previous college articles this season, I have profiled players who I believe are the best underclassman, with Andre Blake of UCONN, Boyd Okwounu of UNC, and Akron defender Bryan Gallago, proving to be consistent players throughout their college career, and in my view should be given GA contracts and be first round picks in the upcoming draft. Truthfully, there are number of potential candidates who have become integral parts of their school's success this season and could move up the list based on how their team progresses the rest of the season. As well, GA's can include high school-aged players, such as Vancouver Whitecaps draft pick Kekuta Manneh, with USMNT U-17 player Rubio Ruben the most likely to join him in the upcoming 2014 draft. Overall, there is plenty of good soccer talent both North and South of the border. The biggest question that always remains is are they capable of making the transition into the pro game? As I mentioned in my Montreal review article, expectation tends to weigh heavily on players who are picked, and GA contracts just add to this pressure. The reality has been proven if you let a player develop, in his own time you'll get the most out of them whether it's at the age of 17, 23 or 26.